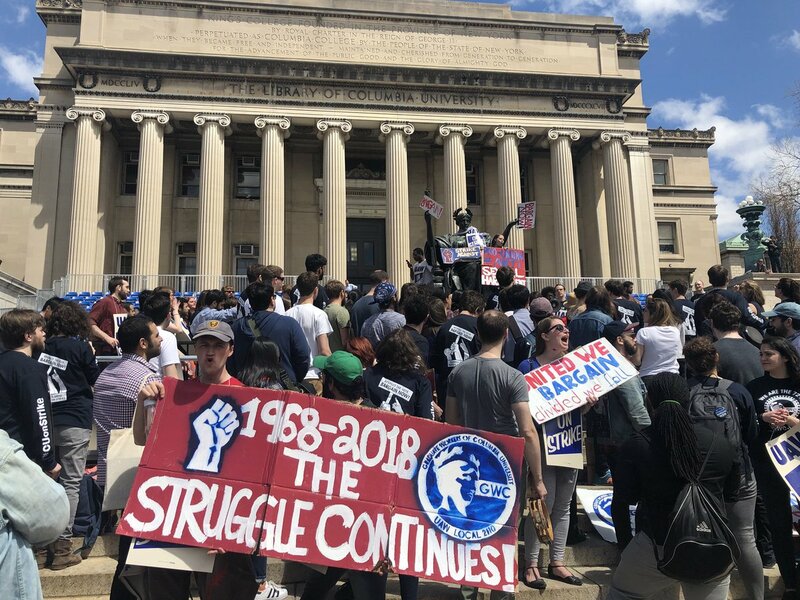 CUNY Struggle has sent the following letter of support to the Graduate Workers of Columbia, presently organizing a campaign against a no-strike pledge. CUNY Struggle is an organization of rank-and-file academic workers in the City University of New York system. Part of our work is organizing within our union — the Professional Staff Congress-AFT Local 2334 — for the kinds of democratic reforms needed to mobilize broadly against austerity. In the last year, we have built a movement that pushed PSC leadership to demand a doubling of adjunct pay to $7000 (7K) per course in its present bargaining with CUNY. We now strive to back up this righteous demand with the weight of the collective power of CUNY workers, students, and the broader New York City working class. To date, we have helped seven campus PSC chapters endorse resolutions pledging to support a strike if the 7K demand is not met. Our biggest obstacle in pushing for 7K has been the mistaken belief, shared by most of our union’s leadership, that meaningful gains can be won outside of a bargaining horizon that includes the possibility of a strike. This has placed us in a grassroots insurgency against our union’s failed strategy of lobbying politicians from a position of weakness. While striking is no silver bullet, and is not to be undertaken lightly, we find the power of every workplace campaign to emanate not from the persuasive rhetoric of its official representatives, but from the ability of its rank-and-file to withhold their labor. Accordingly, we’re worried about the precedent the UAW is setting by forswearing a strike in advance. The UAW of all unions should be well aware of the disastrous historical outcome of no-strike pledges on organized labor in the United States. We support your campaign against this short-sighted and self-defeating measure, and hope that in joining forces we can advance a citywide movement of rank-and-file academic workers, in the spirit of the movement of educators reshaping the terrain of class struggle in the US today. We stand with you, not as sympathetic observers, but as comrades in a struggle that is one in the same. Previous Previous post: Brooklyn College votes YES on $7k or Strike! Next Next post: Grad Center Rank-and-File Beats Back the WAC Attack!